Traveling with Dexter The Dog is by far my favorite pastime. 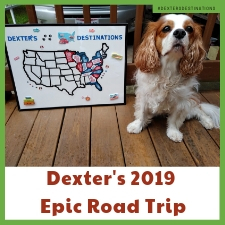 Today I thought I would share Dexter’s travel checklist. These are dog traveling essentials I never leave home without, if Dexter is in tow, and let’s face it, if it’s a vacation, Dexter is going and is actually front and center in my vacation activities. 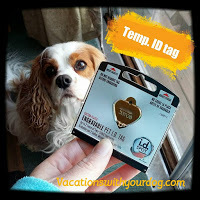 Dog Id Tags: I wrote dog id tags vs. dog id tag, because when Dexter travels, he has two tags. The first dog ta g is his regular tag with our home address, cell phones, and “On Meds” ID. The second tag is made prior to our dog vacation with the address and phone number of the dog-friendly accommodation we are staying at. Let’s face it, sometimes people will look at a dog’s ID tag, and only follow through if the address is close by. By offering two contact locations, hopefully, this doubles the chance of someone returning Dexter to me. And if they don’t, let’s just say there is going to be some ! @#$ to pay! Current Photo: Along the lines of having a few dog IDs, having a current photo of your dog may come in handy if he ever does get lost. This not only will increase the chances of finding him, but also helps show proof he is your dog. Medications: I would never leave home without Dexter’s medications. I make sure that I have at least one extra week of meds during all trips. 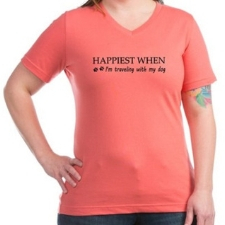 I also travel with natural dog anti-nausea herbs and supplements and something for diarrhea. My current go-tos include HomeoPet Digestive Upsets, Safe Journey, RX Vitamins Clay, licorice root, slippery elm, ginger, and peppermint. Food: Once again, I recommend bringing a few extra days of your dog’s food with you when you vacation with your dog. Because I home cook for Dexter, I actually don’t have to worry too much about it, because I can always cook up a healthy meal. But, if you feed your dog a pre-made dog food, I would suggest at least 3 extra days, more if that food is a premium dog food and harder to find. I also travel with 2 glass dog food bowls and a stylish, insulated lunch bag. Fresh Water: Dexter drinks bottled water, so when we travel, I need to make sure I bring enough bottled water for the road-trip and first day or two of vacation. By day 3, I typically make a stop at the local health food store, where I can purchase more bottled water. We do travel with Dexter’s stainless steel dog water bottle. Poop Bags: We don’t leave the house without our dog poop bags! Oh, and those people who are so rude and don’t pick up after their dogs, they irk me to no end. I KNOW nobody reading this post would be so inconsiderate. Pet Wipes: We all have little accidents, especially if your dog has a flowing tail or feathers. And nothing is worse than your dog having a dirty bottom and you don’t have anything to clean it up with. Yikes. Traveling with some pet wipes saves us from this embarrassment. Dog Towels: When it rains, it may pour. A wet, stinky dog is not enjoyable for you or your dog. 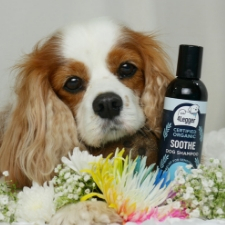 By having an absorbent dog towel, you can make sure your dog is dry and warm at all times. Dog First Aid Kit: This, of, course, is always in my car. However, if I’m traveling with a friend or another family member, I have to remember to bring my dog first aid kit. You never know when an emergency might happen and having the right tools, quickly, can possibly save your dog’s life. Scary to think about, but it’s best to have a plan. Veterinarian Records: The last thing you want is to be in a stressful medical situation with your dog and not have his current medical history. Blood work, medical treatments, and test results are always important pieces of your dog’s medical history to assist in current medical treatment. It is also a good idea to find a local veterinarian and emergency vet clinic near your destination and have that contact information on you at all times. 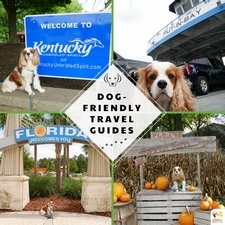 Travel Dog Restraints: Unfortunately, our dog’s travel safety is not regulated. 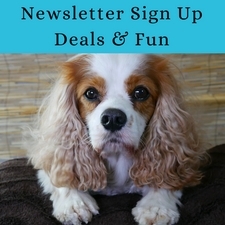 The dog restraints you may find in a pet store are not always tested for accidents. It’s a bit of the Wild West when it comes to dog safety. I wrote a post about ways to learn if your dog’s travel harness or travel crate is safe, here. Belly Bands: If you have a boy dog and there is a chance he may mark, dog belly bands are a must. Dog belly bands wrap around the boy part and prevents a dog from urinating on inappropriate spots. Toys, Bones and Chews: Don’t forget your dog is still a dog and will likely want an evening chew and play. It is a good idea to bring some of his favorites, just in case you don’t find something special at the local dog boutique. Dog Travel Bed: I never leave home without a portable dog bed for Dexter. This allows Dexter to have some comforts of home and to know where “his spot” is. This is especially helpful in a dog-friendly hotel. Long Leash: Along with your dog’s regular leash, having a nylon or floating dog leash is a great way to give your dog a little freedom, while ensuring his safety. A long dog leash can range from 10-100′. Dog Stroller: This is an always for Dexter. A dog stroller offers many benefits when traveling with your dog. If you’re like me, sometimes a daily adventure gets to be a long, long, time, a bit more than Dexter can handle walking. By having a pet stroller, I can pop Dexter inside and keep on moving. It also allows Dexter a little place to rest with some privacy. When we visit dog-friendly restaurants, it’s perfect to have Dexter inside, preventing him from getting underfoot. Camera and Video Camera: I don’t have to remind you to bring your camera on your dog-friendly vacation, do I? Maybe a gentle reminder to charge the batteries and have enough memory for all your dog photos. I dig my GoPro for video and my Nikon D5000 for photos and of course my smartphone on the go. What travel essentials do you pack for your dog-friendly road trip? Let me know in the comments. This is a grat list. Will send it to my brother. Will surely be very useful for him. Thanks! I hope other dog parents find these items as useful as I do. Thanks for sharing this. I will share this with family members that have a dog. Thanks for sharing! I appreciate that. I can only imagine how tough it must be to travel with pets. You make some very good points. Thanks. Being prepared always makes traveling easier and less stressful. This is just like packing for kids when traveling. Dexter has a great owner looking out for him. <3 Thank you. It really is! 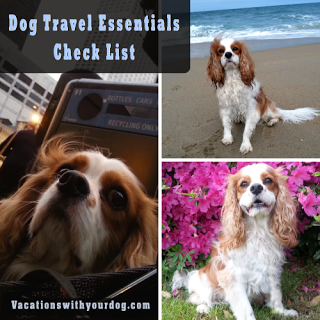 These is a great list for people who travel with pets! We had a lot of these when we moved and took our cats in the car with us. This is a great list! Especially the towels. I had to learn the hard way how important bringing towels when you travel with dogs is! Now I always make sure to pack them. I never knew about belly bands. We have 2 female dogs for that reason, fear of leg lifting and urinating on things. Thanks for sharing! Looking at this list, makes me realize that the preparation dog parents have to do is very much similar to us. Wow! What an exhaustive list of pet essentials while travelling. I never heard of belly bands or dog strollers. The one about the current photo made me smile. <3 Glad to help. Belly bands are a must with pups if marking is a concern. Better safe than sorry. Having a dog is like having a child that needs lots of care and attention. Glad to read these guide! This is such a fun and interesting post! Thanks for sharing this. Dog lovers would really love this post. Thank you. Hopefully, it’s helpful. Thank you. Oh, Beagles are one of my favorites! Go for an adventure, so much fun. We are hoping to get a dog this month. Once we do that, I know where to come for all the tips! Nice roundup. There is a lot to be gleaned from this article like the pet first aid kit. Dog needs to unwind too you know? 😊 For pet owner like me this tips are very helpful esp. like us who loves to travel. Yes! I’m so glad to hear you enjoy traveling with your dog. So much fun. GSD are such great dogs. This is a great list and so helpful to have handy when you’re managing the organized chaos of trying to get ready for a trip! lol I have a check list app on my phone. I’d be lost without it!